In 1970, The Family Stone were at the peak of their popularity, but the maestro Sly Stone had already moved his head to a completely different space. The first evidence of Slys musical about-turn was revealed by the small catalog of his new label, Stone Flower: a pioneering, peculiar, minimal electro-funk sound that unfolded over just four seven-inch singles. Stone Flower's releases were credited to their individual artists, but each had Slys design and musicianship stamped into the grooves - and the words ''Written by Sylvester Stewart/Produced and arranged by Sly Stone'' on the sticker. Set up by Stone's manager David Kapralik with distribution by Atlantic Records, Stone Flower was, predictably, a family affair: the first release was by Little Sister, fronted by Stone's little sister Vaetta Stewart. It was short lived too - the imprint folded in 1971 - but its influence was longer lasting. The sound Stone formulated while working on Stone Flower's output would shape the next phase in his own career as a recording artist: it was here he began experimenting with the brand new Maestro Rhythm King drum machine. In conjunction with languid, effected organ and guitar sounds and a distinctly lo-fi soundscape, Sly' productions for Stone Flower would inform the basis of his masterwork Theres A Riot Goin' On. The first 45 came in February 1970: Little Sister's dance floor-ready You're The One hit Number 22 in the charts - the label's highest showing. The follow-up, Stanga, also by Little Sister, made the wah pedal the star. The third release came from 6IX, a six-piece multi-racial rock group whose sole release, a super-slow version of The Family Stone's Dynamite, featured only the lead singer and harmonica player from the group. Joe Hicks was the final Stone Flower stablemate; his pulsing, electronic Life And Death In G&A is one of the bleakest moments Sly Stone ever created on disc (Hicks prior single for Scepter, Home Sweet Home, the first released Stone Flower production, is also included). This long overdue compilation of Sly's Stone Flower era gathers each side of the five 45s plus ten previously unissued cuts from the label archives, all newly remastered from the original tapes. In these grooves you'll find the missing link between the rocky, soulful Sly Stone of and the dark, drum machine-punctuated, overdubbed sound of There's A Riot Going On. 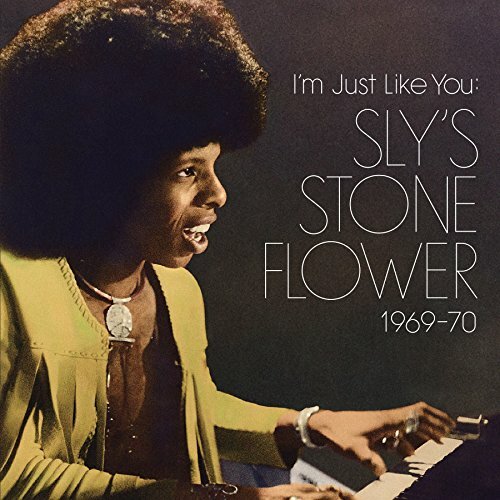 I'm Just Like You: Sly's Stone Flower 1969-70 opens up the mysteries of an obscure but monumental phase in Stone's career. Compilation and notes by Alec Palao, and featuring an exclusive new interview with Sly Stone himself. Contains in-depth liner notes with first-hand reminiscences of the Stone Flower era from many of the participants. In total: all five Stone Flower produced singles plus ten previously unissued cuts from the label archives. All tracks newly remastered from the original tapes. 2xLP and CD housed in a gatefold 'tip-on' jacket.